You want to reach new audiences and communicate with your existing customers. Sounds simple enough – but what is the best way to reach them? Well, let’s take a look at marketing channels. Marketing channels are the lines of communication between your product and your customers. Just like your business plan, your marketing strategy develops tactics to communicate with your target audience. These are all great questions to ask but before we can give you an answer, we have our own questions to ask. Are you trying to promote a new brand or is this a well established brand? Is your goal to generate leads and sales or to build brand awareness? Do you have internal resources to build content? What is your budget? What kind of timeline do you have in mind to achieve your goals? In a perfect world, you would have an unlimited budget and utilize all of these different channels to grow your business. 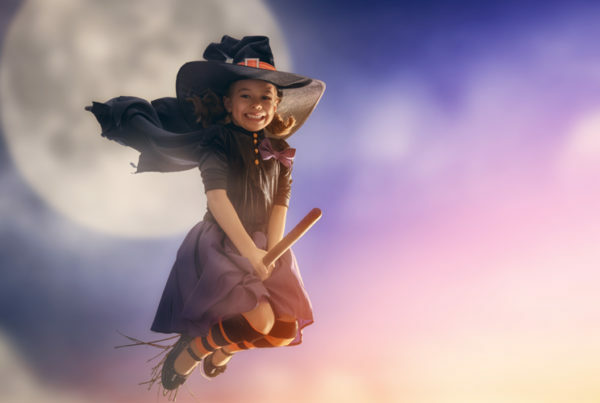 The reality is, most of us have a budget to work with and hope to get the best bang for our buck, or because we are marketers, Return on Investment (ROI). 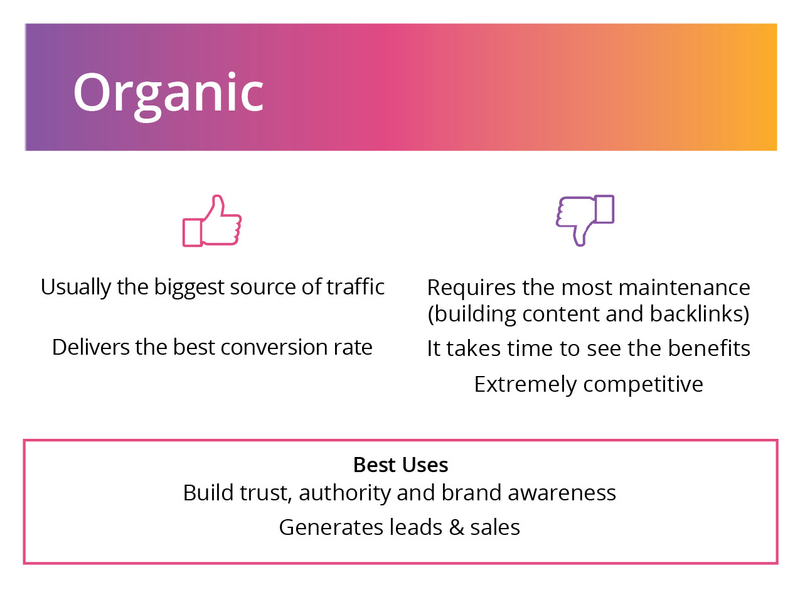 This is why it is so important to identify and validate your goals before investing into these marketing channels – lucky for you, we’re here to help. Paying to appear at the top of the search rankings. Requires the right combination of keywords, effective copywriting and landing pages. 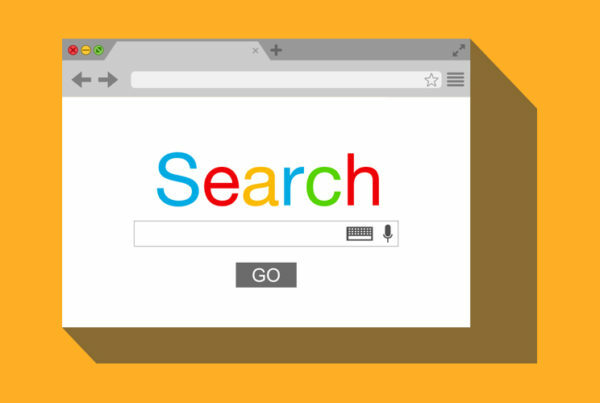 If your goal is to generate leads and sales as soon as possible, a paid search campaign would be the way to go. 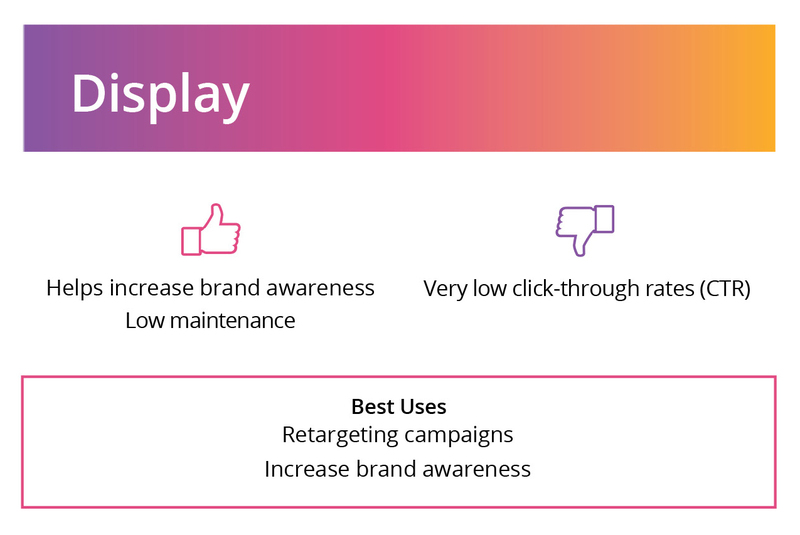 It is intent-based, meaning your ads will be displayed to users who are actively searching for products and services like yours. However, this makes your business dependent on your campaign. As soon as you turn the tap off, leads stop coming in and your sales volume drops. Paid search is great to get an immediate impact, but it can also become a kind of crutch. Search engine listing that has not been paid for. Requires great content, on-page SEO and valuable links pointing to the site. Imagine this: you rank well in Google for highly competitive terms and you don’t have to pay for each click. You got there because of Search Engine Optimization (SEO). 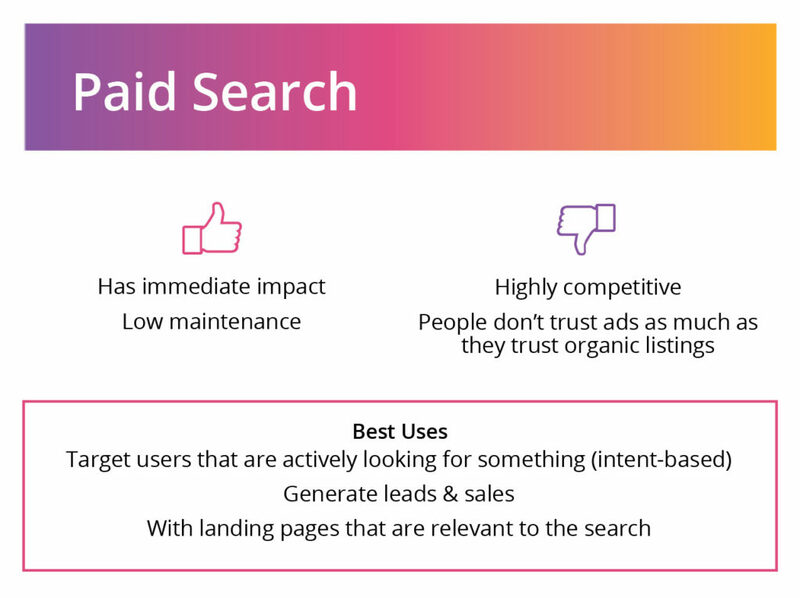 Your listing is not a paid ad so people tend to see you as being a trustworthy source and they visit your website because it matches a search term they have used to find something they are actively looking for. Your page loads quickly, looks great on any device, has great resources to download, several helpful blog posts, is well organized and provides a great user experience. This makes your website a lead magnet. Because of the great resources it provides people link to it without you having to beg them to do it. This sounds great, doesn’t it? But it takes time and efforts to get there. For SEO to be more effective, you need to publish high quality and unique content regularly. You also need to have a fair amount of quality and relevant websites linking to yours. And then there is all the technical stuff behind it. Things don’t happen overnight with SEO, but with some patience, effort, and know-how, your website will benefit from it greatly and for the long-term. Paying to appear in social feeds and other sections on social networks. Requires proper targeting and effective copywriting. Getting traffic to your website is great but there is a lot of competition out there. Converting this web traffic into sales can sometimes be challenging without a strong brand. Customer retention can be difficult without consistent engagement. And what happens to your leads after you replied to their initial email or had a phone conversation with them? Do you have a process in place to contact them at a later time about a new product or service that might be more suited to their needs? 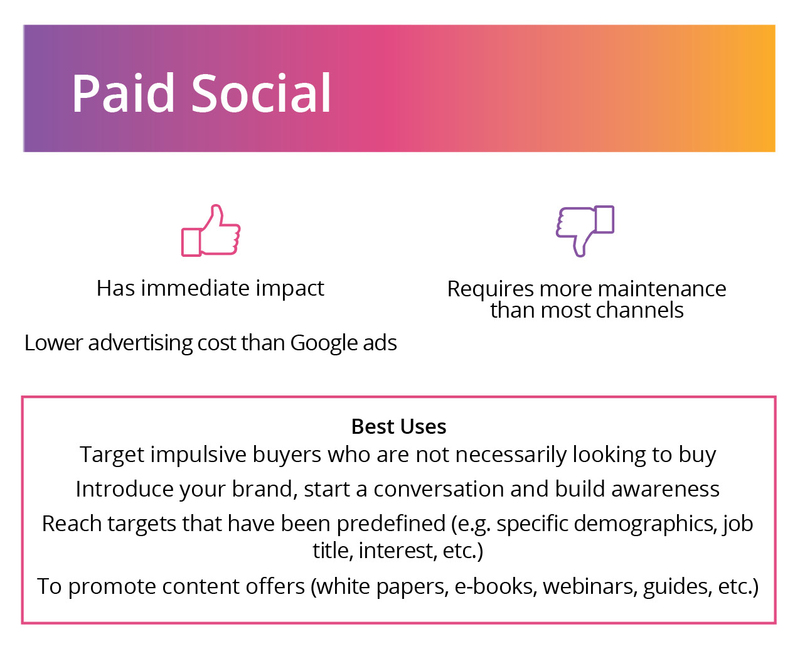 Like paid search ads, social ads provide an immediate impact. However, using social as part of your strategy requires more maintenance because of the content creation aspect of it. Conversion rates also tend to be lower when compared to search ads because it targets users who are not necessarily looking to buy at the time they see your ad. The benefits of using social are too important to ignore. With the right strategy and resource allocation, you will maximize your return and create new opportunities. Paying to have videos and display ads appear on YouTube and/or third party sites. Requires engaging visuals. Let’s get this straight. 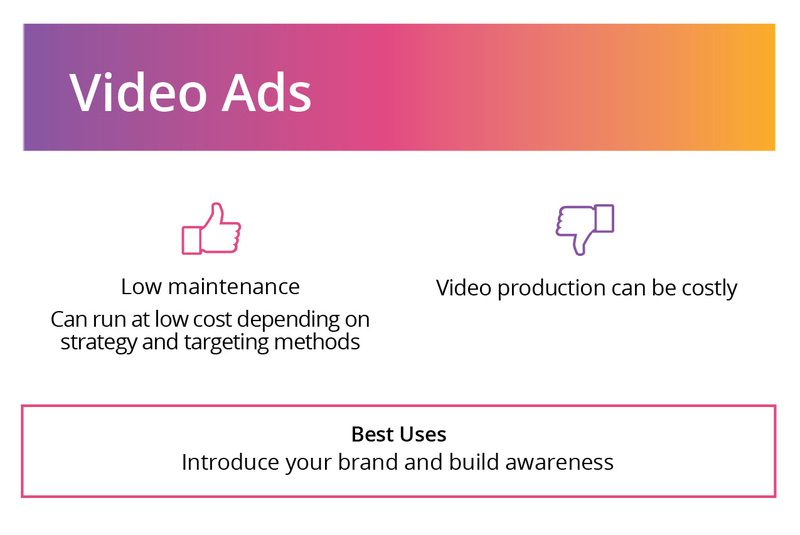 Display and video ads will not generate a lot of traffic for your website but they can help increase brand awareness and support your other campaigns. People might not click on your ads but they see them and become more familiar with your brand. It creates a sense of trust and strength, which can in turn make people more likely to become customers once they are ready to buy. Paying to promote stories on third party sites. Works best with on-topic content. 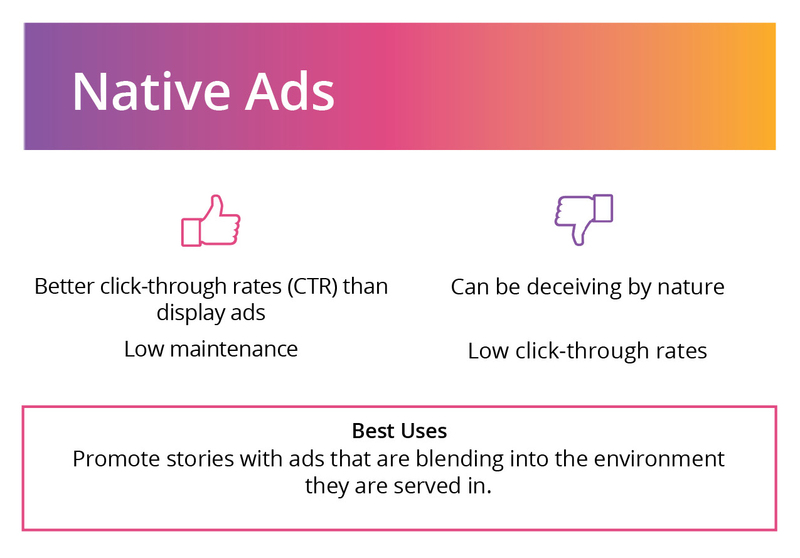 Native ads are kind of a cross between social ads and display ads. Like display ads, they are served on partner sites that can be targeted in different ways. The difference is that they blend into the environment they are served in, which makes people more likely to click on them. It can be an effective way to promote blog posts and news stories. Like social ads, they are more about building awareness than generating leads. Email marketing newsletters. Requires engaging content and offers direct contact to your customer. Want to speak directly to your customers, right in their inbox? Then an email marketing campaign is the way to go. Kind of like your social followers, newsletter subscribers opted in. 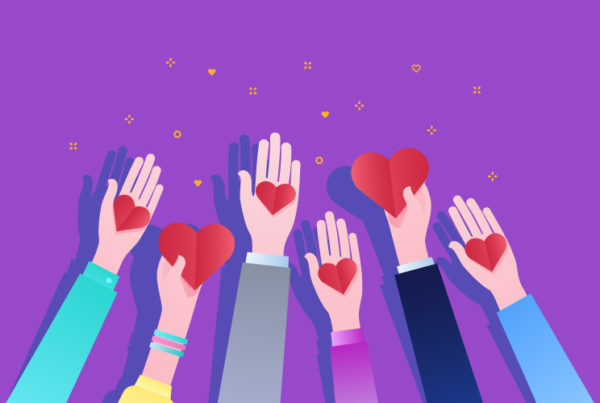 They are often existing customers, partners, friends, employees and people in your industry that might not necessarily be ready to buy from you, but can be great brand ambassadors. 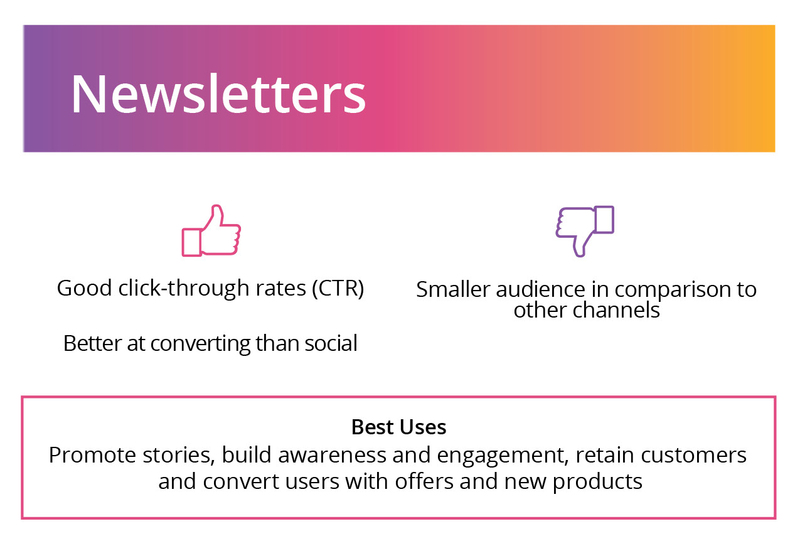 By their very nature, newsletters perform better than any other channels when it comes to open and click-through rates. The larger the mailing list, the more value it provides (but bigger does not necessarily mean better – striving to create a targeted, well-kept list is crucial for success). The challenge resides in finding ways to grow your list, remaining consistent, building content and staying consistent with your brand. In short, the use of multiple channels in your marketing strategy will deliver better results in your journey to greatness. Keep in mind that each channel has its own merit. It all depends on the goals you are trying to achieve and the budget and resources you have to work with. Leveraging the pros and cons of each channel allows you and your marketing team to create a marketing plan tailored to your business.